The night before, we had enjoyed our dinner by the light of a hurricane lamp, but for breakfast at 7 am it was broad daylight. In Luozi there is no electric power from the Inga falls. Lendo and a little old lady managed the household. I said ”Pauline?” to her, and she answered ”Oui” (fr. yes). This lady was the same Pauline that the Swedish missionary Alice Sandblom had written about in her diaries in the 80´s. Kerstin, Jenny and I had read as much of them as we had found time for. In the diaries, she tells of the Swedish Christmas celebration, of Robert butchering two cows (the same Robert that we visited the day before), of his wife Ruth taking care of the meat, of which they kept one part and sold the other. Edi and Robert came to see us off. Robert was on his way to his farm fields in his sturdy jeep. Edi said a prayer for us, and we left Luozi. Our first goal was to catch the ferry at 8 am. On the way, a lunatic drove past us at such a speed that he barely touched the ground. He literally flew over all the holes in the road, which thanks to a blessed rain during the night before, were partially filled with water. It was a divine miracle that no one died due to this man’s reckless driving. God is the protector of fools and children; the lunatic got a spot on the ferry, we didn´t. Waiting for the next departure, some of us sat down and rested and others took a stroll by the river. In Congo the time comes to you, it doesn´t fly from you. Celine, the wife of the vice-president of the Church, accompanied us in the bus. Another extra passenger failed to turn up. No cars or busses go empty, the full capacity of the engines are used plus another 50%. All vehicles carry a combination of goods, people and animals, certainly very environmentally friendly. In Sweden we are far behind in this matter. The other day, we passed a bus just like our own. On the roof a goat was tethered. The goat seemed to be feeling fine, maybe even enjoying the fresh breeze and the view. The inventiveness is limitless in this fascinating country. After a while, the ferry had returned to our side of the approximately 2 km wide Congo River, and it was our turn to get on board. Some of us waded, but most of us got on the bus. Our capable chauffeur took a run with the bus, but unfortunately we got stuck hanging over the edge of the ferry after an impressive crashing sound. The only thing to do was to back up the bus and take another run at it. This time we managed to get on board. But unfortunately we also had a much noisier bus. It roared like a Hercules plane with four engines. We went as far as the village Kimbemba, where we stopped on a school yard. 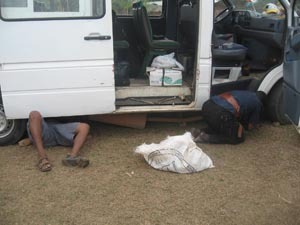 Both the chauffeurs got under the bus to fix the exhaust system. Hugo took out his tool box and his duct tape and assisted them. Hugo and his tool box have been priceless on this trip. He is the only one of us that has been to Congo before. While the bus was being repaired the rest of us got to know the school children of Kimbemba. First came a class of about 40 five-year-olds. In the lack of proper classrooms, they had their first lesson in the school yard. Their teacher had been practicing his profession for 58 years, he told Gunnel. Bernt taught and conducted singing with the group of children, which was appreciated by everyone involved. We visited the older children in their classrooms. At the back, the children had desks, but the rest of them had only a board to sit on and nothing to put their books on. We were greeted with loud cheers and I think we caused a lot of disturbance for the teachers, but they didn´t turn us out. All the children wore white shirts and blouses, and navy blue trousers or skirts. They looked healthy and we were touched by the happiness they radiated. During lunch break they gathered around us, a hundred of them. Some of them carried their school books in plastic bags. Bernt conducted singing once again, and there was much laughter and cheering. Suddenly, the children ran away and we saw them line up outside the classrooms. The headmaster talked to them and they walked into the school in procession. Some of us ‘talked’ to the older children in secondary school. They told us that primary and secondary school each consist of six forms, and that they were in the 4th form. One of them read to us from his English exercise book. They didn´t have any textbooks, only exercise books, and what they read they had written themselves. They asked us if we could give them proper English textbooks and had we been in the vicinity of a bookshop we would have done so right away. I gave them my last business card and explained how to reach me on the web if they got to an Internet café. Every person has an enormous potential under the right conditions. To acquire knowledge and good values opens up immense possibilities. What fine boys! Maybe one of them was a future president? After an hour and a half, our journey continued with a fixed exhaust system. A Congolese driver must have a very versatile set of skills. The dust wasn´t as trying since the rain had tied much of it down, but all of us were kind of reddish anyway. The temperature was as agreeable as could be, about 25 degrees Celsius. We ended up in the ditch at one point, but our clever chauffeur managed to juggle us onto the road again in a masterly way. Nobody had to get out of the bus. We arrived at Kimpese at 3.30 pm. Tre dagars upplevelser till, jag förvånas över er ork trots värme och ett intensivt schema. Hoppas att ni alla har fått vara friska och så får vara fram till hemkomsten,ja även därefter, omställningen blir nog märkbar. Idag gäller alltså Kinshasa och där tycks det finnas en hel del att uppleva enligt resplanen. Tror att ert motto “Öppenhet-Insyn-Resultat” känns rätt. Kan ana att ni ser fram morgondagen och hemfärden.